This super comfy romper is “must have” for your little one. 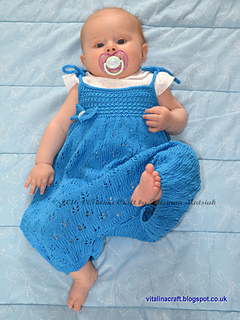 It is quick and easy to knit and fancy wearing. 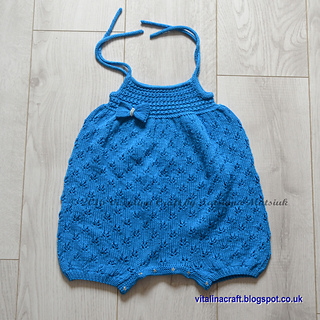 The romper is knitted with beautiful lace pattern and decorated with knitted bow and pearl beads. 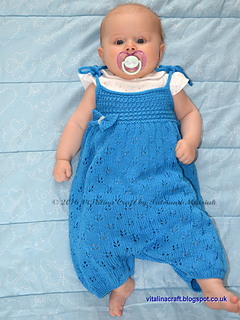 The legs of the romper are knitted back and forth on needles but the body is knitted in the round. Also the top edge is decorated with I-cord bind off and I-cord ties. 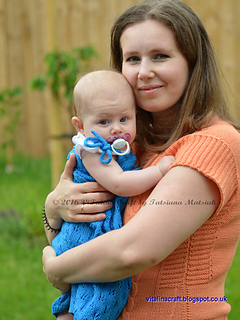 The romper has fastening press studs between legs for easy nappy changing. 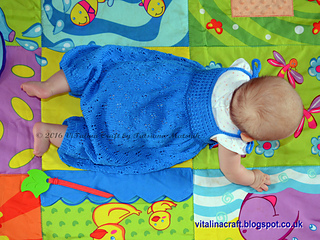 The pattern is written for five sizes: 1-3 months, 3-6 months; 6-9 months; 9-12 months, 12-18 months. My PDF pattern is easy to follow and suitable for intermediate knitters. It contains 6 pages of row-by-row instructions, charts and pictures. REQUIRED SKILLS: Knitting in the round, I-cord bind off. 22 stitches and 30 rows = 4”/10 cm in stockinette stitch using needle size 4 (3,5mm).